After watching Disney’s ‘Tangled’ at the cinema I decided to go on a pilgrim and watch Disney’s first 50th animated films in 50 weeks. After about 45 movies/weeks I went on a trip to Hong Kong and also went to Disneyland for the first time. These are my impressions of Disneyland HK. First off, the music, I made my eyes water. Music from Aladdin, Little Mermaid, Mulan etc. even Mary Poppins, was played every where – that was magical. 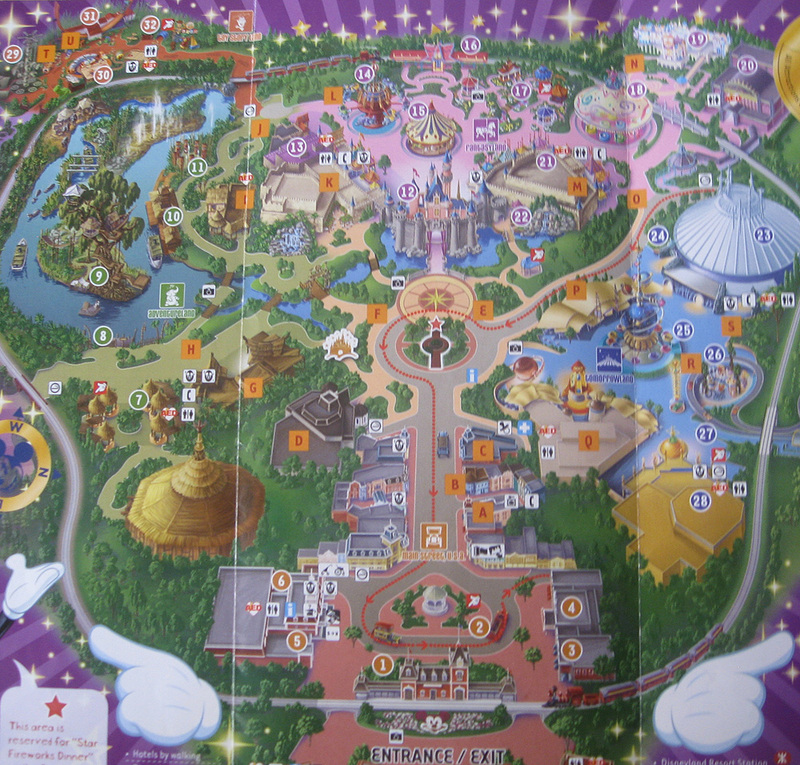 Disneyland HK map. Click to enlarge. We will be going through the attractions only in their numbered order. Mainly shops here. We walked right past this and came back to it at the end when everything was mostly closed. 4) Art of Animation. This place had a cool little history of previous movies like Tarzan, Beauty and the Beast etc, some original frames on display, some sketch animation flip books and storyboards. Not a great deal of stuff there but what’s there was great. The main attraction here is Tarzan’s Treehouse which looks very cool. There was also a section for Lion King. 7) Festival of the Lion King. Was under maintenance that day. Shame. :( 8) Rafts to Tarzan’s Treehouse. The only way to get to Tarzan’s Treehouse. You could say this was required since Tarzan lived on an island. 9) Tarzan’s Treehouse. Very pretty, but there’s not much to do except look at things and take photos. It does take you though the story of Tarzan as you move forward and the statues of the characters look very nice. 10) Jungle River Cruise. Didn’t quite get wet which was nice. The installations are quite realistic. I fell bad for the boat driver since the journey is very linear and even I’d rather go on some other ride than this one more than once on the same day, so having to go through the ride 50+ times a day and still remaining enthusiastic is very impressive. 11) Liki Tikis. Not sure which movie these things are from, but they’re cool and worth a photo or 2. Pretty much where all the princess related attractions are. 12) Sleeping Beauty Castle. Centred right in the middle of Disneyland and used in the Disney logo, this is also where the fireworks show at night happen. The castle lights up and is very pretty to look at. Also, this area is where the Parade was at. It had some impressive floats for Dumbo, Mickey, Pooh, the Princesses, Jungle Book (only time I saw any Jungle Book characters), Lion King, Lilo and Stitch and Toy Story. 13) Mickey’s PhilharMagic. This was so good, I went twice :) The only place you can see classics like Little Mermaid and Aladdin in 3D (or do you call this 4D) singing their best songs. The Lion King one was the only one with some 2D parts in it which made it stand out (in a bad way). I find it hilarious how Mickey is playing the part of the Sorcerer when he stole the hat in Fantasia before. That probably means he inherited the hat from the sorcerer afterwards. Anyways, listening to the songs, seeing the 3d, flying around on the carpet in the wind all felt really good :) 14) Dumbo the Flying Elephant. Looks similar to another ride I already went on but it’s Dumbo so it’s cool. 15) Cinderella Carousel. So… does that mean we’re really ridding rats? 16) Fantasyland Train Station. A neat way to get around the park. I wonder why most of the view is blocked by trees though. 17) Fantasy Gardens. A nice place to take photos of and with some of the characters – when I went I saw Mickey and the gang and Stitch. 18) Mad Hatter Tea Cups. You can make it really dizzy. 19) It’s a small world. Oh boy, that song plays forever in an endless loop. I thought I was getting mind-controlled. Anyways, it’s a little boat ride through all the different continents with a little splash of Disney characters from the corresponding areas. The dolls were generic though. I did like how ‘The Three Caballeros’ were there. I doubt many people would recognize them but at least Donald is part of it so they won’t seem completely alien. 20) “The Golden Mickeys’. I really enjoyed this. First off, before the show starts, there’s a little countdown/preloader and on screen shows all the appearances of clocks in Disney movies. Sure, it’s kinda literal but it does have footage from movies like 101 Dalmatians that aren’t seen anywhere else in the park. The show goes through a number of the songs in selected Disney movies accompanied with dancing acts. I really like the voice of The hunchback of Notri Dame (it sounded just like original – plus it was the only time I saw the hunchback at the park). Having the music sung live is really cool and seeing characters you don’t see outside like Tarzan and the Beast was neat. Mulan was also there but the male singer singing ‘I’ll Make a Man Out of You‎’ was pretty bad. Still, this was very enjoyable mainly because of all the variety and a focus on the original music that Disney made all these years. I was paying more attention to the music rather than the dancing but that’s just me. 21) The Many Adventures of Winne the Pooh. Wasn’t expecting much but it was alright. It takes you pretty much though most of the movie’s story in an entertaining way. 22) Snow White Grotto. A nice place to look at and take photos. A whole area dedicated to Toy Story, making it the most consistent land – this was fairly new when I went. It’s rides are the least generic (Cinderella Carousel is pretty much Merry-go-round) but it’s Pixar and not Disney so I wasn’t as excited. Also, the lines were kinda long so I didn’t go on any rides, because at that time we hadn’t gone to Adventureland yet. 29) Toy Soldier Parachute Drop. This looked pretty cool. 30) Slinky Dog Spin. I wanted to go on this but yes, the line was waaaay too long. 31) RC Racer. Too scary for me. 32) Barrel of Fun. I saw Woody and Jessie there but their costumes looked kinda scary. These were the same costumes used in “The Golden Mickeys”.